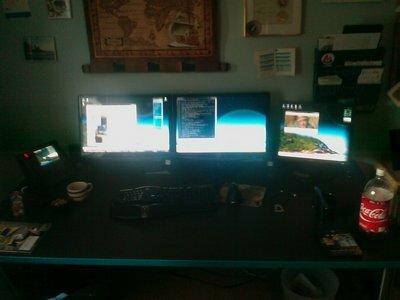 Here’s my desk in a blurry as hell photo. Enjoy. New World Record for Sending Camera to Atmosphere? 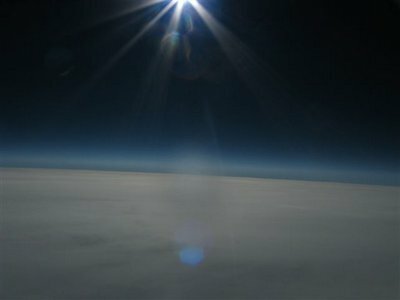 The Great Balloon Chase sends camera up 37.28KM. A buddy of mine helped to send a camera up this weekend in the Great Balloon Chase. Pretty neat stuff. They may have even beaten a world record, how cool is that. An excellent mission where almost everything went right! The prep, launch event, flight and chase could not have gone much better, especially given the weather. This was an excellent team effort. You can view the map on Google Maps. It will show you the path of the balloon, and the pictures it took along the way. Great work on this project guys. Love to see stuff like this. 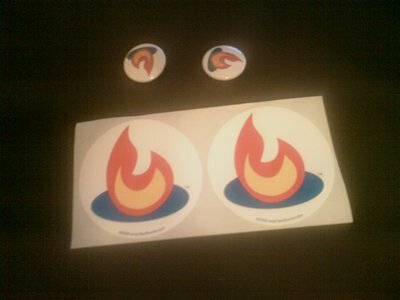 Check it out, a couple fancy stickers and two fancy buttons with the feedburner logo. Hot!